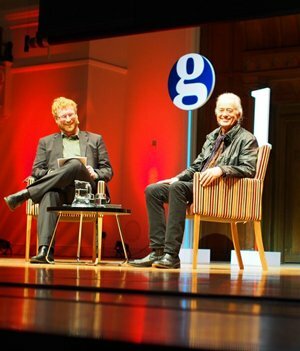 Guardian Music Editor, Michael Hann, interviewed Jimmy Page on stage at London’s Cadogan Hall on Wednesday, October 15th. Jimmy Page spoke about his life in music, sharing the stories behind some of the images from his new photographic autobiography. We’re pleased that guests enjoyed the evening, with many taking to Twitter to voice their thanks. Subscribers were also delighted to take home their copies of JIMMY PAGE by Jimmy Page, complete with a personalised stamp commemorating the event. Follow the links below to order your copy today, or use the following ISBN to order from your favourite book shop: 9781905662326.